Vogue Crafts & Designs Pvt. 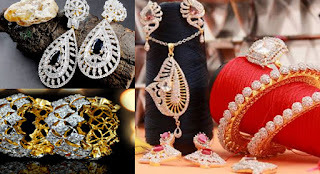 Ltd.: Why is Indian imitation jewelry considered the best worldwide? Why is Indian imitation jewelry considered the best worldwide? Imitation jewelry is the parts of Fashion jewelry only, it is just that this jewelry is more filled with sparkles and glitters and is a kind of replica of gold and diamond jewelry. This has gained popularity over real jewelry day by day; the main reason behind that elegant look is the affordable price. Imitation jewellery is made from precious metals and stone which are very much popular amongst the females. Today Imitation Jewelry has created itself as one of the most important jewelry in the fashion market. Basically imitation jewelry is jewelry for the people who cannot afford high priced jewelry or are looking for a classy and graceful jewelry at a reasonable price. The Designs and finish offered by this jewelry is same as provided by the real diamond or gold jewelry. The only difference is the quality and stones which are used in this jewelry. India has established itself as one of the leading business in imitation jewelry, this jewelry which is largely made of brass, cast iron, nickel, plastic bead and stones. India has the largest hub for imitation and fashion jewelry. They have skilled workers who have immense knowledge about these jewelries. The availability of skilled artisans at low cost as also that of base metals, faux gems and stones has encouraged the sector’s growth in India. Rajasthan, Uttar Pradesh, West Bengal, Bihar and Madhya Pradesh are some of the important states known for such products. India is now leading china when it comes to imitation jewelry business. The demand for imitation jewellery has surged by over 85 per cent in the last one year on account of the sharp rise in gold and silver prices; according to a study by industry body Assocham. The Indian imitation jewellery market, which is presently about Rs 8,000 crore in size, is expected to grow to Rs 15,000 owing to growing demand. According to data from the ministry of commerce, India imported imitation jewellery worth about Rs 130 crore in 2011-12. During the period April-September 2012, Rs 60 crore worth of finished imitation jewellery was imported from China. However, according to the Imitation Jewellery Manufacturers Association (IJMA), this figure underestimates the actual level of imports, which are believed to be 10 times higher. In view of the fierce competition from Chinese imports, IJMA has taken a few steps to safeguard its members. It has started branding India-made imitation jewellery in the last two years.